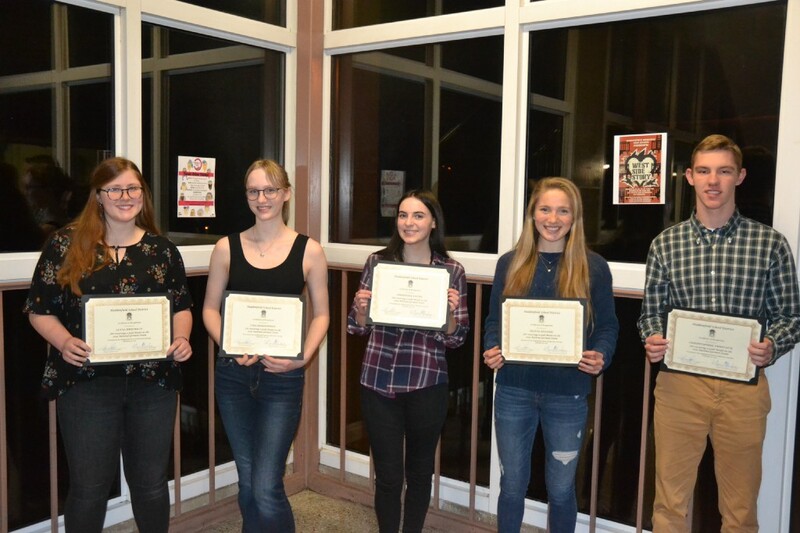 Five students from Haddonfield Memorial High School earned Gold medals in the National German Exam, and were honored for their academic excellence at a Feb. 28 Board of Education meeting. From left: Lucia Herdelin, Lisa Edmonston, Josie Faust, Olivia Stoner, Christopher Deriveaux. Five Haddonfield Memorial High School students were recently awarded gold medals for their performance in the National German Exam for High School Students in Levels III and IV: senior Lucia Herdelin, sophomores Christopher Derivaux, Josephine Faust and Olivia Stoner, along with freshman Lisa Edmonston. Four of those top performers (Herdelin, Derivaux, Faust and Stoner) scored high enough to be eligible to apply for a Study Trip Award to Germany. This award pays for students to live, attend classes and participate in excursions in Germany for three to four weeks this summer. HMHS German teacher Anna Feinleib will forward applications to parents and guardians of eligible students in the near future. Although heading into proverbial “senior slide” territory, Herdelin doubles up on linguistic challenges. In addition to excelling in German, she is also enrolled in an AP Spanish course, and has been accepted to an as-yet publicized university to study foreign languages and education with plans to become a language teacher. “I started taking German last year, and I was interested because my dad used the language, he’s been to Germany and he was an exchange student when he was in high school. After college … I have no idea what I want to do with it, but definitely something German-related,” Faust said. Stoner gravitated toward German beginning in sixth grade on the recommendation of her older brother, and wants to take a gap year in Germany or spend at least one semester there when she chooses a college. “I took German when I moved to Haddonfield and I had a cousin that spoke German fluently. I’m really interested in going to the Naval Academy and I want to use German when I graduate to study abroad,” Derivaux added. Edmonston, however, was not eligible for the Study Trip because her mother and mother’s family are native Germans. That has done nothing to damper her enthusiasm for her family’s native tongue. All HMHS German language students in Levels III and IV sat for the NGE exam, and 50 percent of these students were recognized for their outstanding performance on the exam. Students who scored high enough to garner medals were scheduled to appear at the Feb. 28 board of education meeting. Silver Medals: Juniors Luke Benedict, Elizabeth Donnelly, Edward George, Natalayna Purnell and Haley Qualls, sophomore Nina Tan. Bronze Medals: Sophomores John McDonnell, Mary Kate Murschell and Jenna Walls, junior Jason Possumato. Achievement Awards: Juniors Autumn Eagan, Matthew Eyles, Roman Falcione, George David Haitsch and Elliot Ryan; sophomores Audrey Andrus, Lauren Crumley, Margaret Greenbaum, Lamia Lopez, Evan Miserendino, Neda Savova, Emily Smart and Mack Wolschina. More than 25,000 students nationwide participated in the exam this year. The National German Exam, now in its 59th year, rewards students through an extensive prize program and provide a means of comparing students in all regions of the U.S. Founded in 1926, the AATG represents German teachers at all levels of instruction and is dedicated to the advancement and improvement of the teaching of language, literature and culture of the German‐speaking countries.